German energy utility EnBW Energie Baden-Württemberg AG will build a service hub for its offshore wind farms in the North Sea on an airfield in Emden on a total area of just under 450 square meters. The construction of the two-storey building with office and social rooms and a storage hall for spare parts and tools is scheduled to start in the spring of 2018. 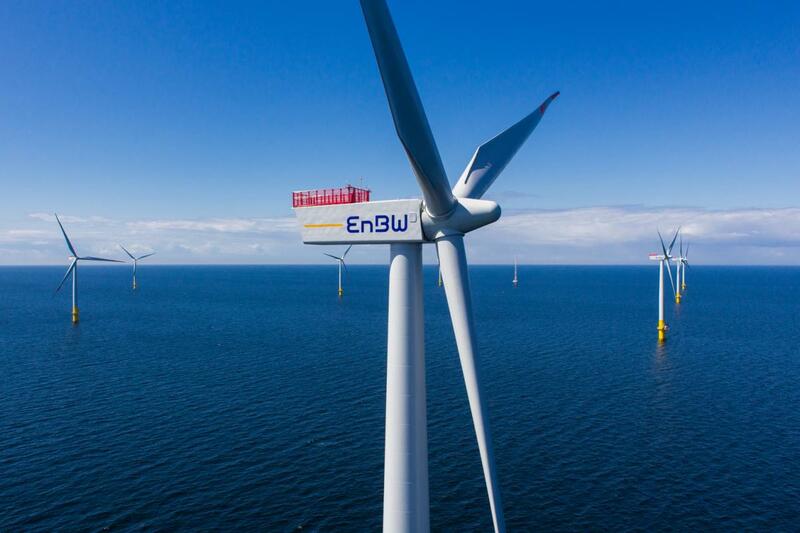 As a new base of the EnBW Offshore Service GmbH, in which the services for the EnBW offshore activities are bundled, the service operations for EnBW's North Sea wind farms are to be carried out from here by helicopter in future. Starting in 2019, around 40 employees will initially be performing maintenance and service work for the offshore wind farms EnBW Hohe See and EnBW Albatros, which are already under construction. The service team in Emden will also be responsible for the maintenance of the planned 900 MW offshore wind farm HeDreiht, which is scheduled to start operation in 2025. In total, 60 new jobs will be created in Emden in this second phase of expansion. Emden’s Lord Mayor Bernd Bornemann said: "The decision of EnBW utility to locate the base of the EnBW Offshore Service GmbH in Emden with a new permanent establishment is an excellent and extremely significant message. Emden is well positioned with its location and infrastructure as a hub for services and maintenance of offshore wind farms in the North Sea. The fact that we were able to convince the global player EnBW with our Emder capabilities shows that we are on a very good way. I am looking forward to the large number of new qualified jobs and the participation of the energy location Emden in the added value of renewable offshore power generation." "For almost a year, EnBW Offshore Service GmbH has already been responsible for the operational management of the offshore substation BARD Offshore 1 with about 10 employees from Emden. We are pleased to be able to expand and deepen our already existing local involvement with the decision to make a location for our new facility", said Ralf Neulinger, Head of Renewable Energy Production at EnBW. The offshore wind farms EnBW Hohe See and EnBW Albatros are currently under construction with a total output of about 610 MW. About 95 km north of Borkum and about 100 km northwest of Helgoland, EnBW Hohe See covers an area of around 42 km². 105 km from both coasts, EnBW Albatros is being built on an area of 11 km². Following commissioning scheduled for 2019, both wind farms will together generate around 2.5 billion kWh of electricity annually. This energy can supply around 710,000 households and save around 1.9 million tonnes of CO2. The power generation of Albatros and Hohe See thus corresponds mathematically to the power consumption of all private households in Munich. EnBW won the contract for the offshore wind farm HeDreiht in the first German offshore tender. The EnBW bid for the construction of the 900 MW project does not require any EEG subsidies, making it one of the first offshore projects in the world to do without subsidies.